As the Mom of a houseful of Star Wars fans, I was sad to hear that Carrie Fisher died today. I know the Internet will be saturated with tributes to her, but I wanted to share our story, too. It meant a lot to me that she and her brother took the time to make a little boy smile. 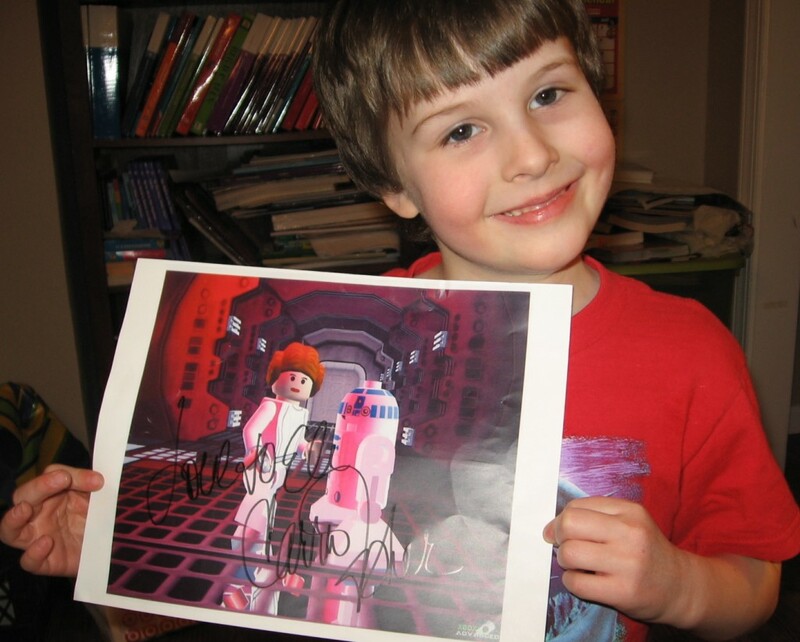 When Eli was six, he had a major crush on Princess Leia. She was definitely his first love. He wanted to tell her how much he loved her, so I suggested writing her a letter. He couldn’t write much at six, so we wrote it together. He drew a picture, and I went online to find an address to send it all to. Trouble was, I couldn’t find an address that I could verify as an official place to send fan mail. I did, however, manage to find an email address for her brother, Todd. So I figured, what the heck? Contact him and see what happens. I just spent an hour digging through my computer to see if I’d saved those emails between me and Todd or if I took a picture of Eli’s letter. Sadly, I couldn’t find either. I remember that I started off by apologizing for bothering him, but my little guy just really, really wanted Carrie to know how much he loved her and I was wondering if he could tell me the proper address to mail his letter. Todd Fisher wrote me back the nicest email ever and said to mail it directly to him, and he’d make sure she got it. I can’t even imagine the amount of fan mail someone like her received, although it did seem that there was a lull in her career around that time. I can’t be the only annoying fan who bypassed channels to get a message to her. But the fact that they responded, so kindly, showed what a class act she was. Especially when you read about her struggles with bipolar disorder and other mental health issues. I, and the majority of people I’m related to, have battled various mental health problems, so the fact that she managed to do so much is impressive to me. Rest in peace, Carrie Fisher. Thank you so much for all the ways you made my family smile.